In this document, we begin by discussing some methods for improving your credit, along with the dangers of using credit repair services. Then, in the second half, we break down the five main credit scoring ingredients, so that you will have a better understanding of the areas in which you need to focus. Jump to credit scoring factors, or continue reading below about the first steps toward improving your credit. Jump to our credit assessment calculator where you can now calculate your credit rating to a very close approximation. If you are coping with bad credit, you know first hand the emotional and psychological toll it can take. Humans, in general, dislike rejection of any type; to be told repeatedly by an arrogant suit that you aren’t good enough to have any of their money, it can feel — well, downright degrading. Rather than moping around, thinking about damaged credit scores and allowing someone else to steal your dignity, let’s take action toward fixing the root of your credit problems. The first thing you should do, is familiarize yourself with the credit-reporting process and learn how to interpret your credit report. We can then take steps to improve your scores. If you are behind on any of your bills, select the most important accounts and make a payment immediately. Focus your efforts on keeping the lights on and a roof over your head first, then move on to credit cards. The longer you are behind on any debt, the more damage you are doing to your credit score. 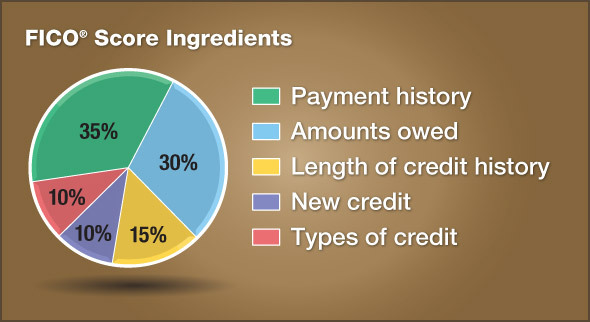 Credit Bureaus report late payments in terms of 30 days, 60 days and 90 days. Obviously, being past 30 days late is a huge problem for a lender. So, assume for a moment that your bill is already 30 days late. It will appear on a credit report as 1X30, meaning it was 30 days late one time. What you don’t want to happen is letting it get to 60 or 90 days late. This is devastating to your credit score. Also, if you have missed a deadline on a payment, but it hasn’t reached 30 days yet, do everything in your power to pay it prior to that 30-day-late mark. If you are 29 days late, the credit bureau won’t report it as a late payment. Always pay more than the minimum balance on all credit cards. Paying the minimum is a two-fold problem. First, to credit bureaus, it appears that you are struggling to meet your bills. Second, because of the way credit card companies compound interest, it makes it nearly impossible to pay off even small balances in less than 25 years, when paying the minimum. So, the credit bureau will see this as a debt that may never go away. Consequently, your ability to improve credit scores will be limited, as long as you’re paying just the required minimum. Keep mortgage loan-to-value low. If you put very little money down on your home, you have little value in the property, so it appears more as a debt than an asset on a credit report, which hinders your power to improve credit scores. Try to add enough money each month to equal a whole extra payment at the end of each year. This will rapidly decrease your mortgage and make you look good, in terms of managing your debt, because the balance-to-limit will be low on a large debt. Credit repair services are not recommended. The things that you pay them to do, you can do on your own for free. As we have stated, you should periodically check your credit report from all three credit bureaus. If you find any erroneous information, you can dispute it under the Fair Credit Reporting Act. When you dispute an item, the credit reporting agency will launch an investigation with the creditor to verify the information reported on the account. Often, the creditor fails to respond within the required 30-day period. If this happens, the entire account must be deleted from the credit file. There is no limit to the number of times you can dispute an item; if the creditor replies within the 30-day period, you may dispute it again. Many people will do this multiple times hoping that eventually the account will slip through the cracks of the system and get deleted from the credit file. So keep in mind, when you pay someone to repair your credit, that is the process they go through; they dispute all negative information with the credit bureaus (repeatedly, until a desired result is achieved), and that is something you can do for yourself for free. When you knowingly dispute accurately reported negative information, you may be committing a fraud. It has been shown that about half of all disputed accounts end up getting deleted because some creditors lack the human resources to respond to all reinvestigation requests. Even if you are just trying to dispute a single inaccurate component of an account, for instance you may dispute an inflated credit card balance that you’ve since paid down and the new balance hasn’t appeared for months, the entire account will be removed from your credit file if the creditor fails to respond to the dispute within the 30-day time limit. Statistically speaking, the cumulative impact of this action when repeated over and over, for more than 50% of credit disputes, tends to change the American-consumer credit-score distribution over time. It used to be that credit scores were used almost exclusively by lenders to determine auto and home loan interest rates. Nowadays, credit scores are used for a bevy of consumer products and services including things like car lease payments, apartment rental rates, car insurance rates, how much you pay to lease television cable boxes, satellite dishes, and even health insurance premiums. With so much on the line, maintaining a good credit score has never been more important, and the key to maintaining good credit is understanding how the score is tabulated. The most widely used credit scoring system is the FICO score, developed by the Fair Isaac Corporation. Your FICO score ranges from 300 to 850, with a higher number meaning the person has better credit and is less likely to default on any credit extended to him. Your credit score is affected largely by your payment record. FICO tracks your payments on things like unsecured loans, credit cards, installment payments, judgments, and retail credit accounts. A good payment history is one which reflects timely payments, with no late payments or fees assessed. The first way to improve your credit score is to make sure all the accounts reporting on your credit report are current. Missing payments, late payments, or defaults will bring your score down more than any other event. To keep your score high, simply avoid these occurrences. If your cash position runs short one month, rather than skipping a payment and being charged with a late mark on your credit report, call your creditor and tell them your situation. Sometimes, if you can make any payment at all, even just a few dollars, the creditor will refrain from reporting a late or missed payment on your credit. This simple action could save your credit score from dropping up to 50 points or more. Over time, as you maintain a good payment history, you will notice late payments and bad marks drop off the report. This will put upward movement on your credit score, telling creditors you are a more credit worthy borrower. The second step in improving your credit score is to minimize the amount of money you owe to creditors compared to the amount of credit available to you overall. The key here is the ratio owed. There’s nothing wrong with having credit lines, but you want to make sure you aren’t maxed out on those lines. A ratio of 30% owed will improve your score, while ratios above 50% will hurt your score. Example: The following chart explains credit ratios in more detail. To determine the ratio divide the outstanding balance you owe by the maximum allowable credit line. Looking at ‘Store Card’ you’ll notice a ratio of 55% ($1,100 / $2,000). This means you have utilized 55% of your credit line on that card, a ratio which will likely drag your score down. ‘Credit Card 1’ is maxed out with a 100% ratio. This account will surely hurt your score. ‘Credit Card 2’ shows proper credit usage, with a ratio below 30%. To improve her credit score, this person would attack the highest ratios first, and then move on to other lower ratios. For example, she might focus all her extra money on paying down ‘Credit Card 1’ until the ratio drops below 30%, and then paying ‘Store Card’ until the ratio drops below 30%. Once all her cards were at a ratio below 30%, then she would start attacking the card with the highest interest rate, paying that off first and moving to other lower interest rate cards. That way, she’ll be improving her credit score and saving money on interest paid to the credit card companies. FICO states that, holding all other things equal, the longer credit history you have the higher your FICO score will be. While it is possible to achieve a high credit score with just a few short months of credit history, your goal should be to maintain credit lines as long as possible, and at the lowest ratio possible. Average age of all your accounts. There is no quick fix to improve your credit score in this category. Unfortunately, only time can help you here. You should, however, make sure that as you continue to use credit wisely, keeping in mind the two hints above; making payments on time and keeping debt ratios low. This category makes up only 10% of your credit score, but it should still be monitored closely. Opening several credit lines in a short period of time, say 30 or 60 days, will hurt your score. This can happen if you run short on cash and need extra credit to get you through the tough times. Being approved for, and drawing down on, several credit cards in a short period of time shows an improper use of credit. You need not be approved for that additional credit line for your score to drop, sometimes just the act of applying can hurt you too. Each time you apply for a new line of credit, that credit company will view your credit report to determine whether you are a good or bad credit risk. Doing so places an inquiry on your report. In the first case, you appear desperate, but the loan officer doesn’t want to take a risk if none of the other banks in town will. In the second case, the loan officer sees someone who is on a credit spree, shopping for all the credit he or she can get. He or she may be financing a bad habit, borrowing to pay off another debt, or just foolish about the amount of credit he or she needs. In any case, the loan officer is unlikely to take the risk by giving you a loan. Too many inquiries in a short period of time can have a negative effect on your credit score. To improve your credit score try to limit new credit lines to just one or two a year, and space them out a few months between. If you find yourself in a situation where you must obtain additional credit you might try calling an existing creditor and asking for a credit line increase, rather than applying for a new line. Many credit card companies offer free gifts to apply for their cards. You may have seen credit card booths at sporting events, malls, or even schools. Avoid these gimmicks, because applying for these cards will place inquiries on your report and likely drag down your credit score. Tip: Dispute inaccurate information on your credit report, and do it today! Bad credit is 50% habit; stop procrastinating and get the process started. The last 10% category is ‘Type of Credit Used’. Types of credit include revolving lines of credit like credit cards and store charge cards, and installment loans which have a fixed term and/or fixed payment like auto loans, and mortgages. Utilization is the key here. How and when you use the lines is important. You don’t need to have each type, nor do you need to refrain from obtaining one or the other. Also, there is no amount of total credit lines that is considered too many, rather the credit scoring companies will consider the total number of lines you have in relation to the type and amount of credit available to you overall. If you find yourself with several open lines of credit that have never been used you can start charging them up and paying them off immediately, or cancel the accounts altogether. Just remember accounts with longer histories will help your score; try to leave open those accounts, especially if they are current and do not show late payments. If your credit score is lower than where you’d like it to be, there are five simple steps that can help you improve your score in relatively short periods of time. Remember, responsible use of credit will help you maintain a high credit score. It will also help you obtain faster loan approvals, with lower interest rates, lower down payments, and lower monthly payments. Credit card companies will likely offer you larger credit lines, and auto loans will be much cheaper than for those with poor credit. Return to the top of page.